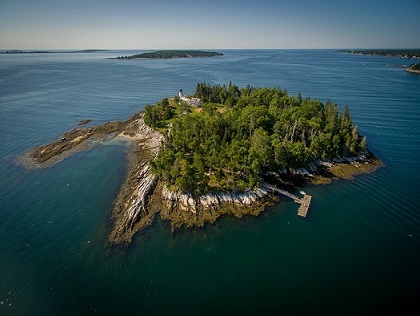 Come learn about Burnt Island’s history, visit its working lighthouse, explore its five-acre island, and/or participate in professional development training. 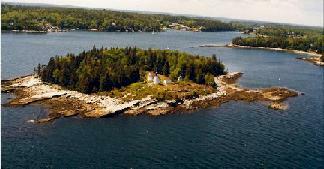 Approximately one mile from the port of Boothbay Harbor, this historic site is an exceptional educational and recreational facility for teachers, school children, summer visitors and boaters. Burnt Island can only be reached by boat. 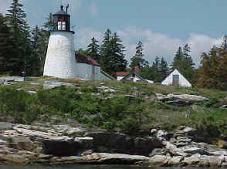 The Burnt Island Lighthouse and dwelling and the Education Center are currently Closed. Tours will resume in July 2019. 2019 Fundraising Events for Restoration Work – In two short years, the Burnt Island Lighthouse will celebrate its Bicentennial. A local, non-profit organization, Keepers of Burnt Island Lighthouse, is raising money to complete its restoration. Please help honor the lighthouse’s 200 years of service by attending fundraiser events. Check this page for events, and visit the Keepers website for event details, find contact information for donations, and learn more about the restoration. Thank-you! Living History Lighthouse Tour – Step back in time (to 1950) and learn about the life and times of Keeper Joseph Muise, a true lighthouse keeper and his family. For information on dates, times, departure location, and more, visit the Burnt Island Living Lighthouse Program schedule. Historic Information – On the National Register of Historic Places, Burnt Island’s rich history began in 1821 when Keeper Joshua B. Cushing lit the lighthouses’ lamps for the very first time. Visit the Burnt Island Programs page for more information about its historic past. Come Ashore – The island is open seven days-a-week from 10 AM – 5 PM, but the lighthouse is only open to tour groups or by appointment. Tour Schedule here. Recreational boaters are welcome to use the moorings and dock, on a first-come, first-serve basis. Please leave the suggested donation of $2.00 per person to help with operational expenses. Professional Development Workshops – 2019 – Enroll in our three-day residential workshops and receive outstanding training in a relaxed and idyllic setting. Teachers and the general public are welcome to participate, and recertification credits are available to educators. Find more information and registration form for this year’s workshops on “Innovative Learning through Nature, Inquiry, and Mindfulness", “Lighthouses across the Curriculum", and “Visual Literacy through Gouache”.